Every day, in natural history museums all across the country, colonies of dermestid beetles diligently devour the decaying flesh off of animal skeletons that are destined for the museum’s specimen collection. That time-saving process was developed and perfected at the University of Kansas Natural History Museum by Charles D. Bunker, a lowly assistant taxidermist who would rise to become the curator of recent vertebrates and who made an indelible mark on his field. That innovative breakthrough serves as a testament to the tenacity of a quietly determined naturalist. Bunker was part of the small team of men who constructed and installed the famous Panorama of North American Mammals, the centerpiece exhibit of the KU Natural History Museum located in Dyche Hall. That iconic building on the KU campus was expressly built to house the collection of mounted animals that impressed the world a decade earlier at the 1893 Chicago Columbian Exposition and Worlds Fair. Once the panorama was completed, Bunker turned his attention to field collecting. Bunker’s field notes provide an accurate, authentic account of several expeditions to collect such specimens as well as a rare view of the extreme hardships of fieldwork in those early days. 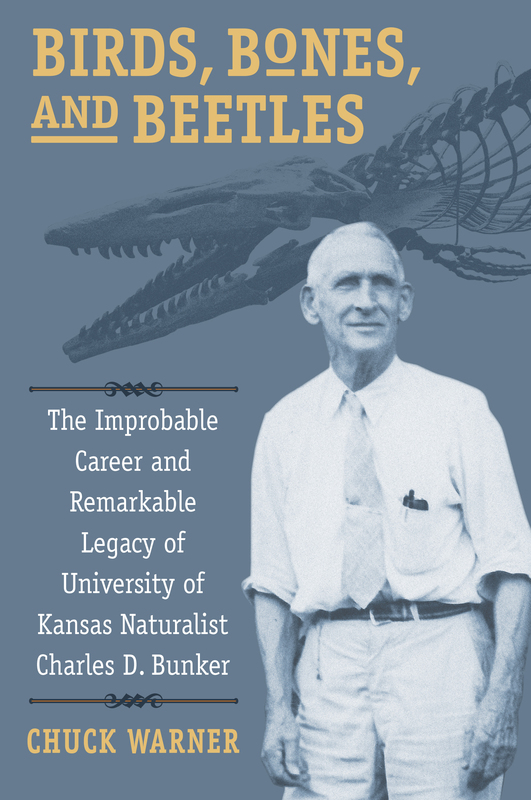 Perhaps most notable is “Bunk’s” 1911 expedition to western Kansas, where he discovered the fossil remains of a forty-five-foot-long sea serpent—later identified as Tylosaurus proriger, an aquatic reptile from the mosasaur genus and the largest example of the species found in North America. In 2014, Tylosaurus was named the marine fossil of the state of Kansas. Birds, Bones, and Beetles tells the story of a man whose passion for learning led to remarkable discoveries, extraordinary exhibits, and the prestigious careers of many students he mentored in the natural sciences. Chuck Warner, grandson of Charles D. Bunker, is a Kansas native and is retired from a career in business and banking.